Pirates of the Mississippi was an American country music group. It was founded in 1987 by Rich Alves (guitar, Hammond organ, background vocals), Bill McCorvey (guitar, lead vocals), Jimmy Lowe (drums), Pat Severs (steel guitar, Dobro), and Dean Townson (bass guitar). 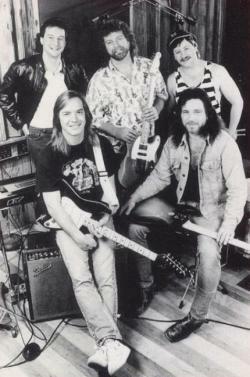 Under this lineup, Pirates of the Mississippi made its debut in 1990 with a cover of Hank Williams' "Honky Tonk Blues". This cover was the first single from their self-titled debut album. "Honky Tonk Blues" was followed by ten more singles, all of which charted between 1990 and 1995. in that same time span, the band would release four more studio albums and a compilation album. Severs was replaced by Greg Trostle in 1994, two years before the band was disestablished. In 2000, Alves and McCorvey reunited and began recording again as a duo, once again using the name Pirates of the Mississippi. The re-established lineup recorded another album, entitled Heaven and a Dixie Night, in 2006 on CBuJ Entertainment.